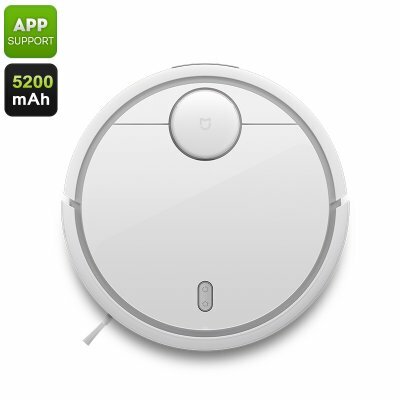 Successfully Added Xiaomi Mi Robot Vacuum Cleaner - Laser Distance Sensor, NIDEC Brushless Motor, 1800 Pa, 5200mAh, App Control, Auto-Adjust Brush to your Shopping Cart. Uses 12 sensors and SLAM algorithm for better cleaning. The Mi Robot Vacuum Cleaner from Xiaomi is an intelligent home cleaning device that will efficiently clean your home so you don't have to. A brushless motor from the No.1 comprehensive motor manufacturer NIDEC delivers a massive 1,800 Pa of suction so it easily outperforms all of it rivals. A Laser distance sensor is used to scan the surroundings of the robot at up to 1800 times per second mapping out a 360-degree picture of the interior of your home. This is combined with a number of other sensors such as the ultrasonic radar sensor, cliff sensor, gyroscope, and accelerometer. With all this data the Mi Robot vacuum cleaner uses its impressive Simultaneous Localization and Mapping (SLAM) algorithm to map the optimal cleaning path around a room avoiding, obstacles, and hazards such as stairs and making sure it leaves no marks behind. This elegant and smart vacuum cleaner can be used with the Mi Home App (downloadable from QR code). This lets you remotely control the robot, change the cleaning modes and schedules as well as keep track of its progress so you can set it to work when you are out. The main brush on this vacuum cleaner automatically adjusts its height allowing it to create a better contact with your floor and remove dirt on uneven surfaces. This automated vacuum cleaner is the perfect home helper and takes care of the chore of sweeping without any input required. A 5200mAh battery brings up to 2.5 hours of cleaning and when the power reaches less than 20% the Mi Robot cleaner will automatically return to its charging dock and recharge, once is charge reaches 80% it will head off again to get on with any unfinished cleaning work. When it comes to emptying the Mi Robot it could hardly be easier, lifting the lid gives instant access to the dust bin making it quick to empty and the main roller and filter can easily be detached and cleaned when required. The Mi Robot vacuum cleaner comes with 12 months warranty, brought to you by the leader in electronic devices as well as wholesale smart home appliances and cool gadgets..